The 9% comes from comparing 20 of the most popular public radio streams in TuneIn to data on those same streams from Triton, which measures all streaming on all platforms (websites, apps, aggregators, etc.). When we look at almost 3 million TuneIn sessions since January for these 20 streams, we see that TuneIn accounts for 9% of all public radio streaming sessions that are at least a minute in duration. That's a lot of listening going on via just one aggregator - almost 24 million sessions for all public radio streams from January through July. These numbers vary quite a bit by stream, and we recommend checking your own station's streams in TuneIn to see where you stand. 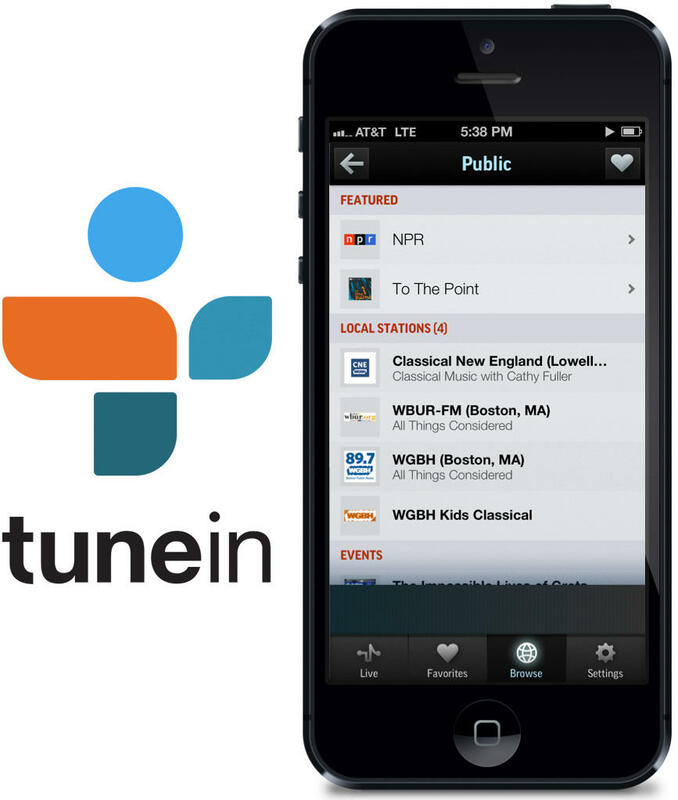 What's even more important is how quickly public radio streaming on TuneIn is growing. There are 4.7 million unique listeners per month for all the hundreds of public radio streams, and that's up 53% year over year. Streaming session starts are increasing 76% year over year. 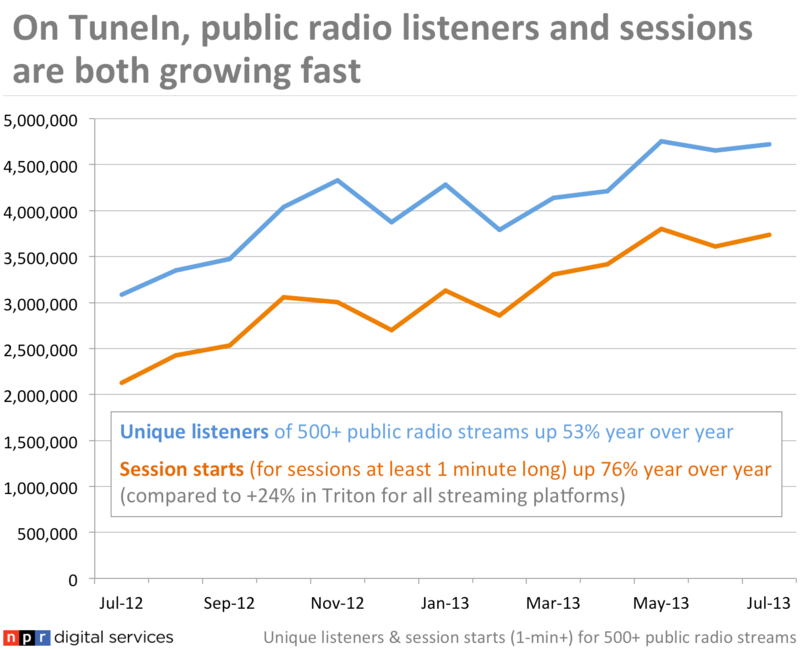 That's about three times as fast as session growth seen in Triton, which means that TuneIn is growing much faster than other ways people can stream public radio. Average time spent listening is also on the rise in TuneIn. Session length has increased 25% year over year. This is particularly surprising, given that in Triton, we're seeing average time spent listening gradually dropping. Why is TuneIn seeing faster growth in audience and engagement than we're seeing elsewhere? Is it because aggregators in general have an advantage at attracting new audience? Is the user experience of TuneIn superior when it comes to finding and listening to streams? Do they have technology advantages? Are they simply marketing better in our communities than we are? We don't yet have answers to these questions, but one thing is certain: we should all be closely watching our metrics in aggregators. If you don't yet have a relationship with TuneIn, you won't be able to see metrics using Amplifer, their analytics dashboard. Here is some information that can help you better work with aggregators.